It is important that everyone on a company, organization, or team is on the same page before a distinct action or decision is implemented. Therefore, it is important to have a effective method of communication so that those concerned can prepare and adjust to what the action or decision may entail. In this sense, sending in a notice to an individual or group that may be affected by the subject is an effective way to inform them in advance. This allows them to prepare whatever may be needed of them and from them. That way there is a seamless coordination in when things start to roll out. 1. Heading: A small detail helps make the notice appear more official, important, and immediate. 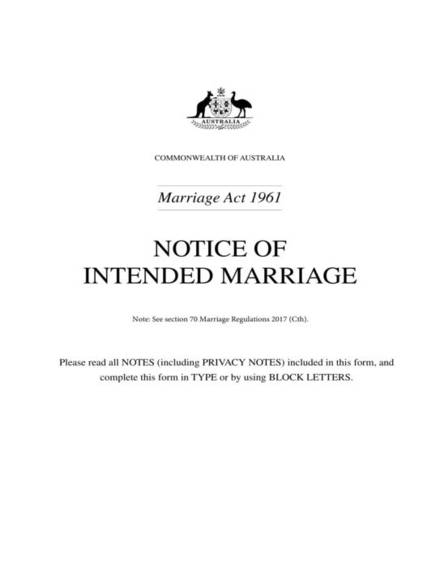 The heading should indicate that the document is a notice. 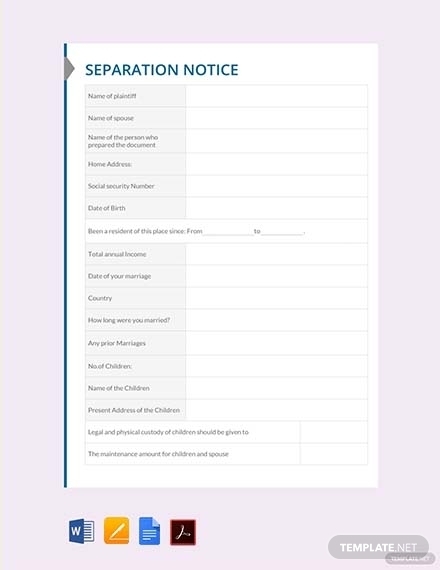 It can also be more specific; for example, when a document has the heading Eviction Notice and is plastered on a certain building or establishment, it means that whoever occupies the space has been evicted. Specifying the heading makes it easier for the reader/s to immediately understand what it is for. 2. Pertinent information: It is essential that you include pertinent information about the notice. It must be able to answer the immediate questions of the reader/s. Details and information should answer the 5 Ws and one H questions, specifically the what, who/whom, when, where, why, and how. Providing pertinent information for the notice ensures that the purpose is easily comprehended. 3. Introduction: Although a notice should be direct to the point and brief, it is still important to include a short introduction. The introduction can be where you present the purpose of the notice, basically an overview of what can be read on the entirety of the notice. Aside from that, an introduction can allow the reader/s to prepare for what can be stated on the body. 4. Supporting details: Since the introduction is basically just an overview, you need to provide additional supporting details that will clearly explain the purpose of the notice. That way there will be no room for any questions. This also justifies and proves the credibility of the document. Formal notices or legal notice provide specific code or name for laws or rules that has been followed in the issuance of the notice. 5. Closing: The notice should be concluded on a strong note. The closing should reiterate what decision or what subject has been discussed in the body. However, it should just be succinct and straightforward. In some notices the closing provide the details such as contact information in case queries may arise. 1. Determine what kind of notice you want to create: A notice can be used for any purpose. This means that it can also have various types that you can choose from. Before you begin creating a notice it is best that you know what kind or type of notice you want to create. Determine what best suites the purpose it will serve. 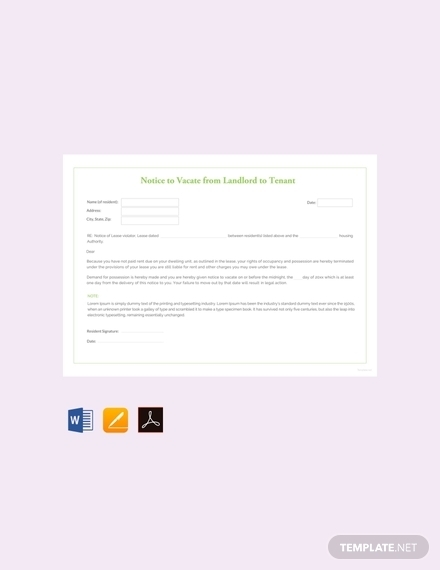 You can check out notice templates and examples to help you easily create the specific notice that you want. 2. Make a first draft/outline: If you decide to start creating a notice from scratch, it is best to start out with a draft or outline first. Making an outline ensures that the flow of how you present information is seamless and coherent. It will also allow you to create the notice to fit the specific purpose it will be used for. Aside from that, it also helps you avoid making mistakes on the final draft. In addition, once you have an outline, you can easily change things up if needed since it is still not the final output. 3. Provide pertinent information: The main purpose of a notice is to inform the reader/s about specific information regarding a certain subject. Thus, it is important that you provide accurate pertinent information about the subject/message that you want to convey. For example, in a resignation notice you need to clearly explain the reason why you have decided to leave your current position, but aside from that you need to provide the exact date you want to exit from the company or organization. It is essential that you answer the what, who/whom. when, where, why, and how questions so that your notice can be comprehensible. 4. 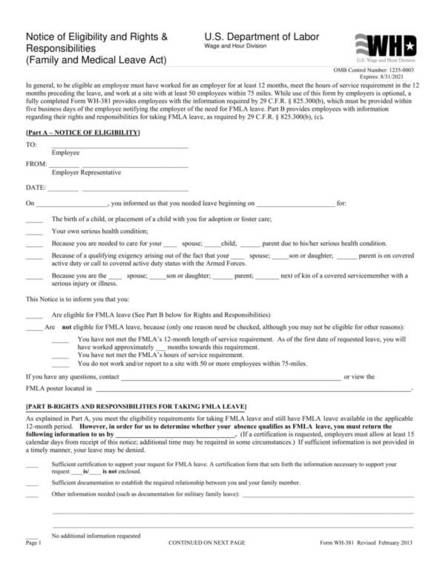 Ensure there is an authorized signature: A meeting notice needs an authorized signature so that reader/s can be assured that the information stated are accurate and credible. 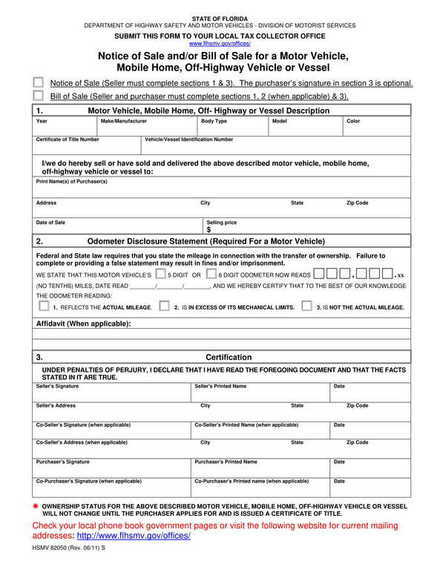 In any other notices, a signature from the authorized body/person means that what has been discussed as well as the information stated are all final and factual. Their signature means that they vouch for the information/decision/action that is conveyed in the notice. 5. Proofread and edit: Before publicizing the notice, make sure there are no mistakes and errors. Proofread the notice for any spelling errors, accuracy of information, and so on. You can also ask input from colleagues if the way you presented the information is good and effective. If there are changes, make sure that you edit it accordingly. Lastly, it is best to proofread and edit the notice before you submit to a higher-up and asking him/her to affix his/her signature. A heading should be included; in this case, the word Notice should be bold and indicate on the topmost part of the paper. Be direct and straightforward; use clear and simple sentences and words. Details, especially the date, should be accurate; ensure that you provide the correct information. Use short but complete sentences. Be specific in indicating who the notice is for. Aim to answer all the reader/s’ questions; leave no room for questions. Should there still be questions from reader/s, indicate where they can direct those queries. Ensure that an authorized signatory affixes his/her signature on the bottom of the notice. 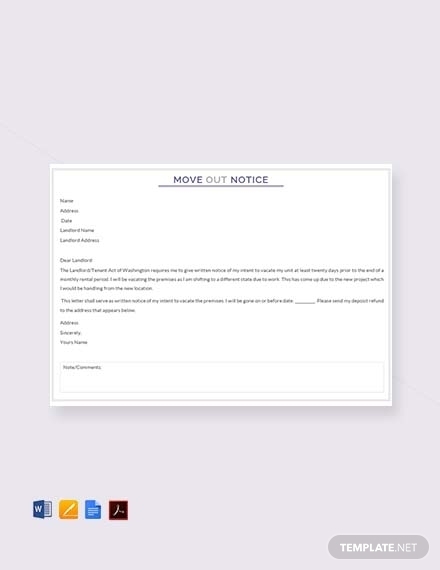 Move out/Eviction notice or notice to vacate due to unpaid rent: This notice is given by a landlord to a tenant to convey that he/she has to move out within a specific date due to failure in paying the rent. Most of the time, this notice still gives the tenant some time to settle accounts or to prepare for the move/eviction. 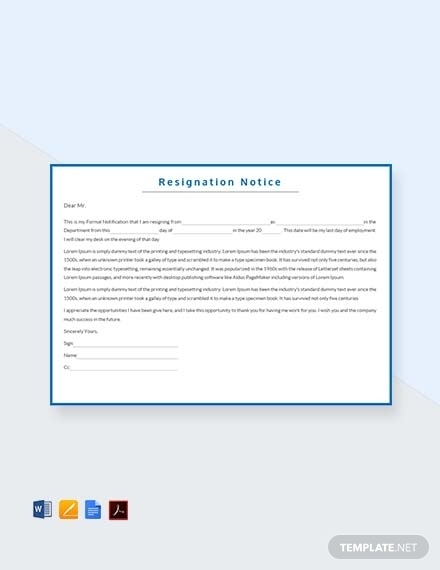 Resignation notice: When an employee wants to resign, he/she gives the employer a heads up about his/her decision. 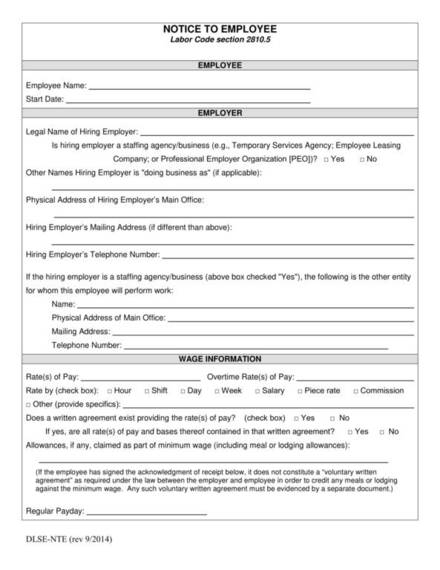 It is a standard to give a notice of at least two weeks before the date he/she wants to officially exit the company or organization. 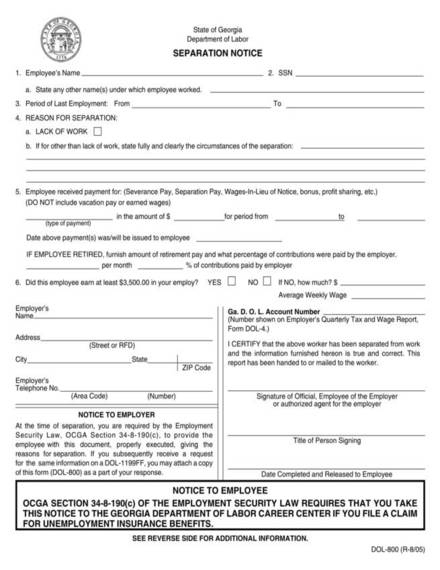 Termination notice: This notice can either be for tenancy or employment-related transactions. A landlord can terminate a tenant’s lease if he/she has violated some rent or lease policies. 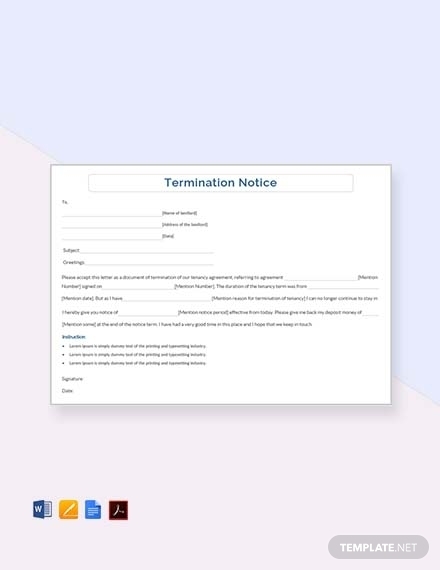 An employer can also terminate an employee’s employment if he/she has violated company or organization policies such as consecutively performing below what is expected, and so on. 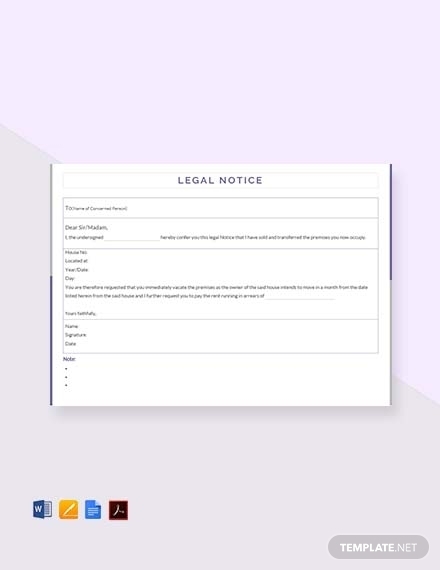 Legal notice: A legal notice is a type of notice that is publicly posted or advertised through media outlets informing a legal action or intent. Meeting notice: This notice is distributed to those involved to inform them in advance about a meeting occurring on a certain date and time. 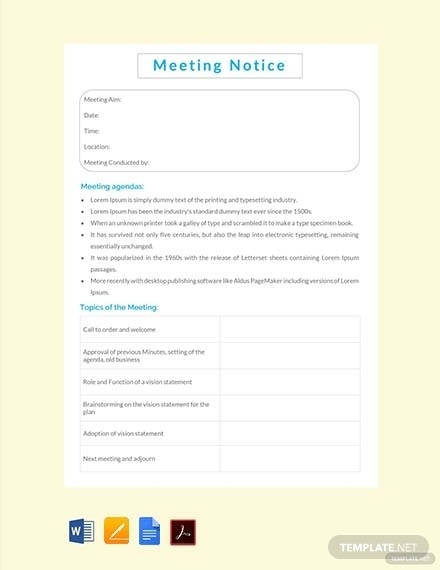 This informs the reader/s about the specifics about the meeting such as when the meeting will occur, on what date and time, where it will be held, and so on. 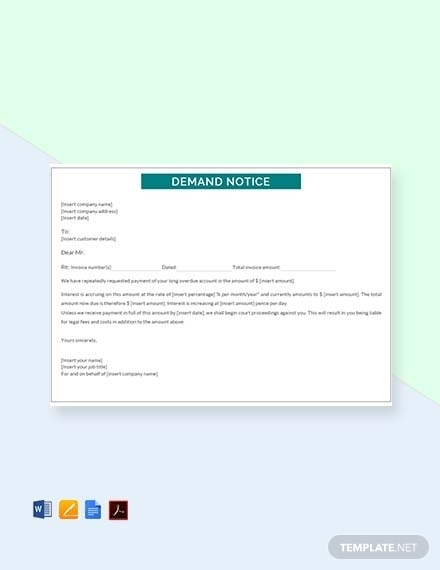 Demand notice: A demand notice is used to demand payment for an amount that is due. In most cases, banks use a legal demand notice to notify debtor of his/her amount due and payable. This also serves as a warning that the bank will initiate proceedings in the courts of law against the debtor should he/she fail to pay the said amount. 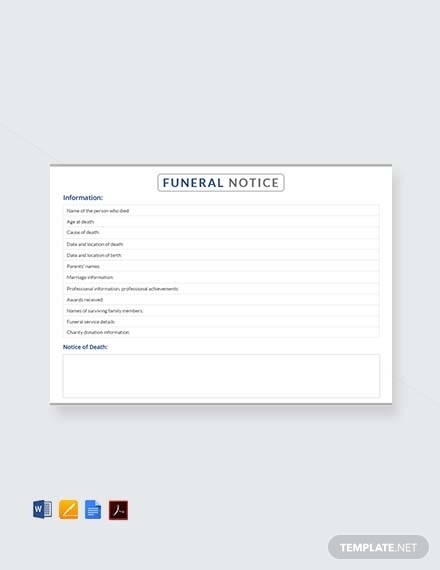 Death notice: Death notices are designed to provide notice that a person has died. It’s a brief summary of the essential details regarding the death of the person. Unlike an obituary that is a detailed biography of the deceased, a death notice is basically a notice written to inform those concerned about the death of a person. Disciplinary notice: This notice is given to individuals that is sanctioned to a disciplinary action. An employee can be given a disciplinary notice to inform him/her that he/she will be undergoing a disciplinary or corrective action to correct and improve unacceptable behavior or performance. What format should be used when writing a notice? As mentioned, a notice can be used for varying reasons. Thus, there is really no right or wrong format to use. It is best to tailor it to specifically fit the purpose it will be used for. The format is just a minor detail in the process of making it, you should totally focus on providing accurate and clear information. 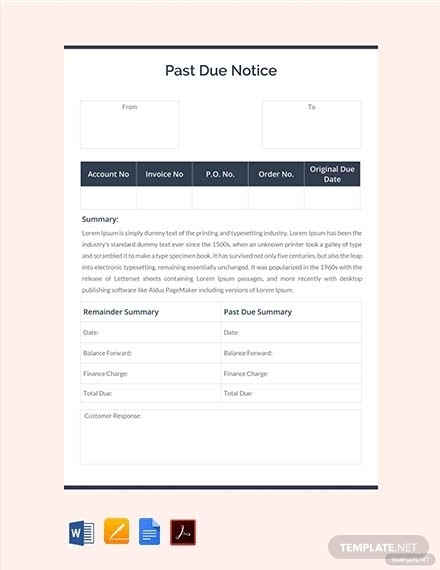 What are the benefits of using a notice?